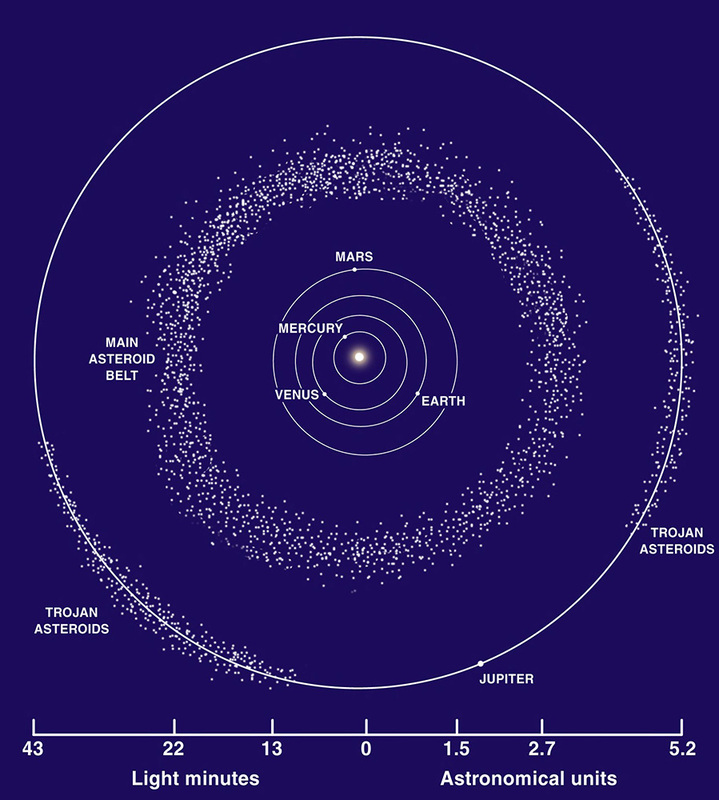 The asteroid belt, sometimes called the main belt, is an area of space that is located between the orbits of Mars and Jupiter and it is known to be occupied by millions of asteroids. Although there are millions of asteroids in the main asteroid belt, more than half of the whole mass of the belt is contained in the four objects Ceres, 4 Vesta, 2 Pallas, and 10 Hygiea. Ceres is the largest object at 950 km in diameter and officially classed as a dwarf planet while the others do not have a diameter larger than 400 km. The remainder of the objects in the main belt can be anything from a few hundred kilometres in size to single dust particles. Over 200 asteroids in the asteroid belt are known to be over 100 km in diameter. Between 700,000 to 1.7 million asteroids are thought to have a diameter of 1 km or more. The total mass of the asteroid belt is thought to be just 4% the mass of our Moon. The asteroids in the asteroid belt are a combination of C-type, S-type, M-types and V-type asteroids. The first spacecraft to make a journey through the asteroid belt was Pioneer 10 in 1972. 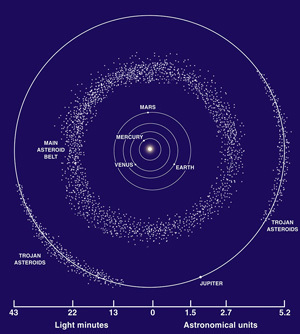 Location of the main asteroid belt in relation to other objects in our solar system. You may imagine the asteroid belt to be filled with millions of tightly packed asteroids making potential space travel extremely hazardous. This is not necessarily the case. The asteroids in the main asteroid belt are quite thinly dispersed which means it is possible for spacecraft to travel through the asteroid belt without difficulties. In fact many unmanned space probes have travelled through the asteroid belt with no impacts.